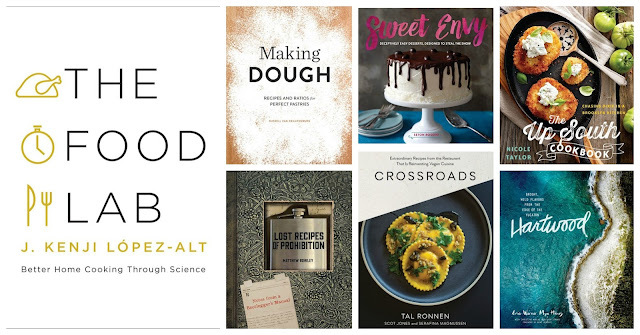 Crossroads (Artisan, October 2015): I'm as surprised as the rest of you that this vegan cookbook caught my eye, but the publicist promises it's divine--and the brief glimpse I got supports his claims. The Lost Recipes of Prohibition (The Countryman Press, October 2015): HOW COULD I NOT LOVE THIS. Sweet, Savory (and sometimes Boozy) Cupcakes (The Countryman Press, August 2015): See above. Sweet Envy (The Countryman Press, October 2015): Super fancy, super simple. My kind of baking. The Food Lab (Knopf, September 2015): This looks to be the bible of all cookbooks coming out this year; in-depth coverage to come in Shelf Awareness. Hartwood (Artisan, October 2015): One breathtaking cookbook (in a world of breathtaking cookbooks), exploring food from the Yucatan (which I'll fully admit to knowing little about). Making Dough (Quirk, November 2015): Back to basics with the quirkiest of publishers--dough! This is a weak spot in my own cooking repertoire, so I'm intrigued. The Up South Cookbook (The Countryman Press, October 2015): Southern food, Brooklyn-style. As with other books acquired at BEA, I'll be covering these closer to publication date, so stay tuned for more depth on each.